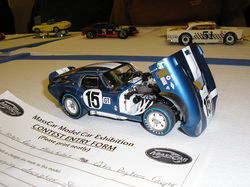 MassCar’s mission is to promote good fellowship through a common interest in model cars. Members can share modeling techniques and often conduct “how-to” demonstrations at club meetings. Also, new types and sources of models, kits and supplies are shared, along with interfacing with other model clubs. MassCar is a member of the International Plastic Modelers’ Society/USA or IPMS/USA. Most members construct model cars based on plastic kits, but some build them out of metal, wood and a combination of materials to achieve realism in scale. New ideas, an appreciation for the work of others, and exposure to the best of the model car experience are MassCar’s goals. Lots of people build models by themselves, with no one to share their interest. MassCar offers an outlet (or inlet) to the hobby through fellowship with other modelers and collectors. Participation at meetings and events builds confidence and expertise in modeling and collecting through a wider circle of friends. We invite you to browse our website, and if you like model cars, join the fun.